As part of our sports management course, the Sports Elective students of PGDM Program conducted ‘Box Cricket Tournament’ first of its kind in Mysore, on January 12 & 13, 2018 at SDMIMD. The “CS&MS Cup – Box Cricket Tournament” was inaugurated by Shri M.J. Charan, Former Director, National Tennis Academy, New Delhi; and Visiting Faculty, Sports Management Program. The event was as platform to implement the knowledge and expertise gained through the sports management course. The team from Sapient College of Commerce and Management, Mysore, emerged as winners with cash prize of Rs. 15,000 and CS&MS Cup. The team from ATME College of Engineering were the runners up with cash prize of Rs. 10,000 and certificates. The event attracted more than 500 footfalls during the tournament days. 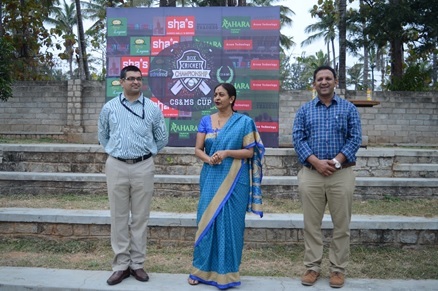 SDMIMD Deputy Director and Program Director of Sports Management Program Dr H. Gayathri and Dr. Srilakshminarayana. G., Assistant Professor, graced the inaugural ceremony. The SDMites Finance Club – Finnacle organized the annual club event Vittaksh on December 4, 2017. This year the event was focused on the theme “Economic Reforms: Snakes or Ladders”. An online quiz conducted on November 24, 2017 shortlisted 12 team out of 107 team participated, for finale held at SDMIMD campus. B-schools like SIBM Bangalore, XIME Bangalore, Christ University, ICFAI Bangalore, NIMMS Bangalore, SIMSREE Mumbai etc., participated in the final round. Inaugurating the event the Director of SDMIMD Dr. N.R. Parasuraman, shared the latest trends in the field of finance and management and gave insights on what is expected from B-school graduates by the industry. Dr. M. Sriram, Professor - Finance and the mentor of the Finnacle Club, presented the theme of Vittaksh 17 and explained how a healthy competition is assessed. The competition saw in total 3 rounds which included rounds on Derivatives, Economic reforms and Private placements that made the participants to be on their toes to be crowned as the Ultimate Financier. Team “Mavericks” Comprised of Mr. Zahid M. Jamal and Miss Simranjeet Kaur from SIBM, Bengaluru bagged the first prize with a cash amount of Rs 20,000 and Team “Vanquishers”, comprising Miss, Makshi Misri and Miss Urvashi Jeswani, from (Sir, I will get the information) emerged as the runners-up who claimed a cash prize worth Rs 15,000.